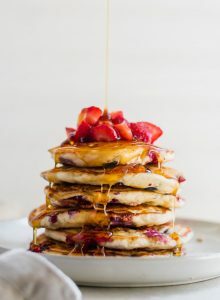 These simple oil-free vegan banana pancakes with berries are easy to make in 10 minutes with just a few everyday ingredients. You’ll need flour, almond milk, salt, baking powder, sweetener, banana and berries. Mix together the dry ingredients before adding the banana, milk and sweetened. This will ensure the baking powder is evenly distributed. Make sure you allow the pan to heat up before cooking. 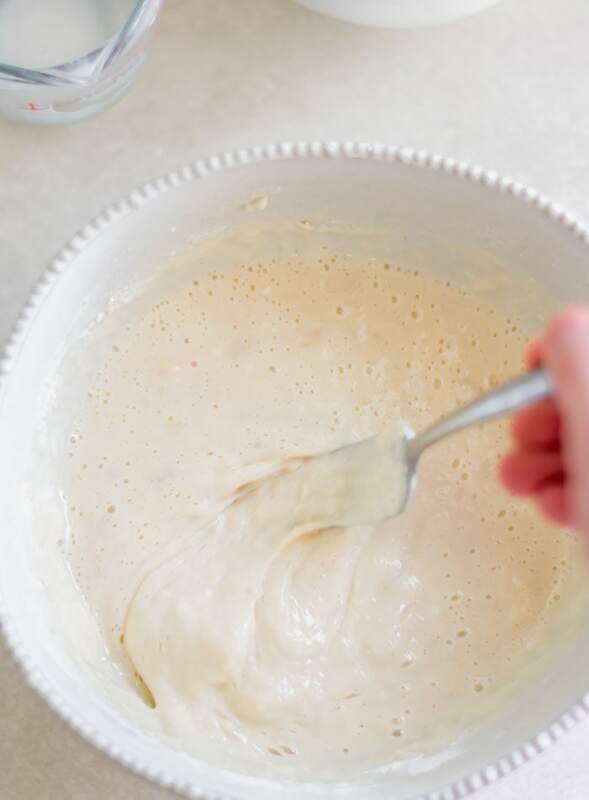 Don’t over-mix the batter. Gently fold together until the flour is wetted. 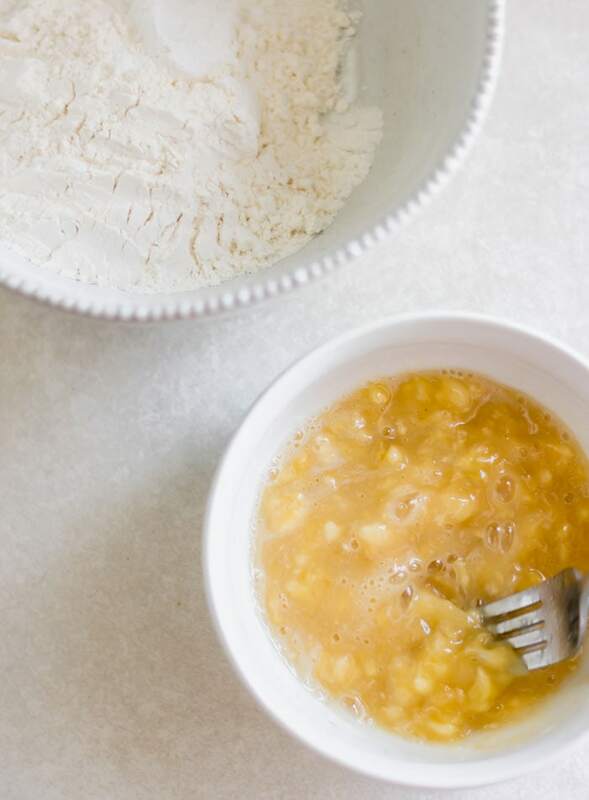 If there are few spots of dry flour left that’s better than over mixing them. Be patient while cooking them. Watch for the edges of the pancakes to look dry and firm and a few bubbles to pop up. Once you see that, flip away! Theyshouldd be golden brown. Once you’ve flipped them they’ll only take a minute or two on the other side. Use your favourite nut butter such as almond butter or peanut butter. I love this with a quick drizzle of maple syrup and a little sea salt sprinkled on top..it’s amazing! Baked or sautéed cinnamon apples or pears. Use my quick baked pears recipe to make apple or pears or saute them in a pan with coconut oil and cinnamon. Coconut yogurt is a fave of mine. I sometimes mix it with pumpkin and/or vanilla protein to make a kind of pumpkin pudding and use that as a spread. Any fresh fruit is perfect. Date caramel is another favourite. There are a few different ways you can make it. For a very simple version, blend dates with hot water or you can add some almond butter or tahini for an extra special caramel. Either way a pinch of sea salt is key! These simple vegan banana pancakes are oil-free and sugar-free if you use stevia or don’t use any sweetener at all. They only take about 10 minutes to make too. The recipe can be doubled or tripled for a family-sized batched and kids love them. For a fun weekend treat for both kids and adults, try adding 1/4 cup of dairy free chocolate-chips the batter. For the best perfectly sweet, banana flavored pancakes, use an extra-ripe banana in these. If the banana has brown spots, it’s perfect! These are delicious with or without the berries, so if you don’t have any on hand don’t worry about it. However, fresh or frozen berries work, so if you do, add them in for extra flavour and nutrition! If you want to get really crazy, try adding some vegan chocolate chips! Love banana?? Double up on a banana by adding sliced bananas when you add the berries. Love banana bread? 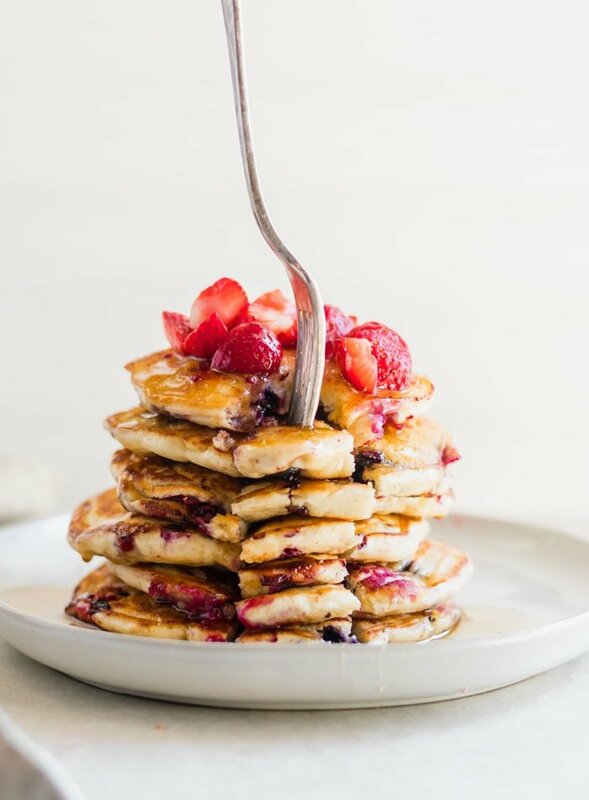 Omit the berries, add 2 tsp of cinnamon and a small handful of crushed walnuts to the batter to make banana bread pancakes! 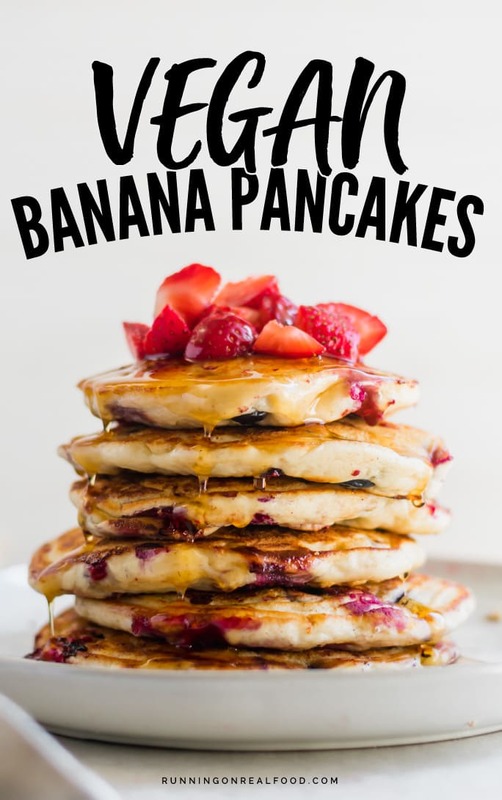 These simple vegan pancakes are light and fluffy and take just minutes to make and never disappoint. 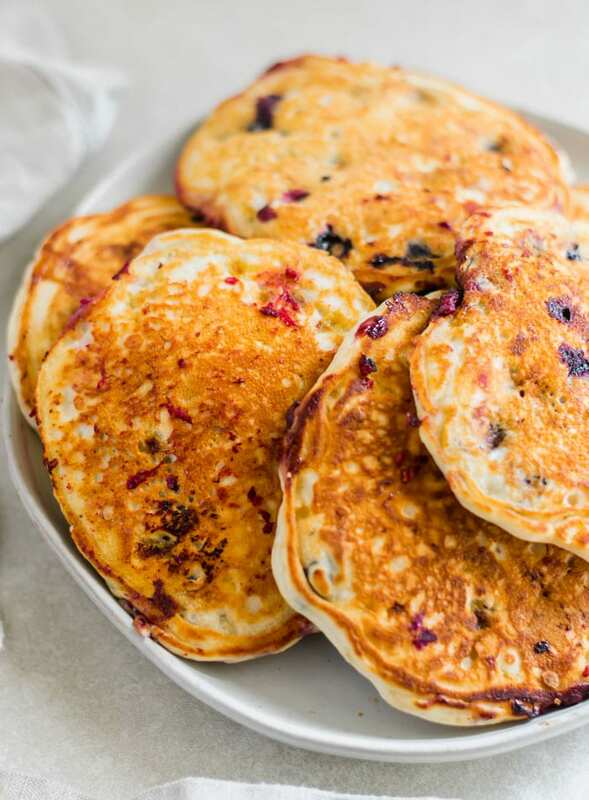 Load them up with fresh berries, banana and maple syrup and enjoy them for a special treat! Mix the flour, baking powder and salt together in a medium to large mixing bowl. In a separate mixing bowl, mash the banana then add in the milk and sweetener and mix together. Add the banana mixture to the flour and baking powder mixture and fold together until “just mixed.” The flour should be completely wetted but still a little lumpy. Heat a pan over medium-high heat and spray with non-stick cooking spray if needed. Add approx. 1/2 cup portions of the batter to the pan. 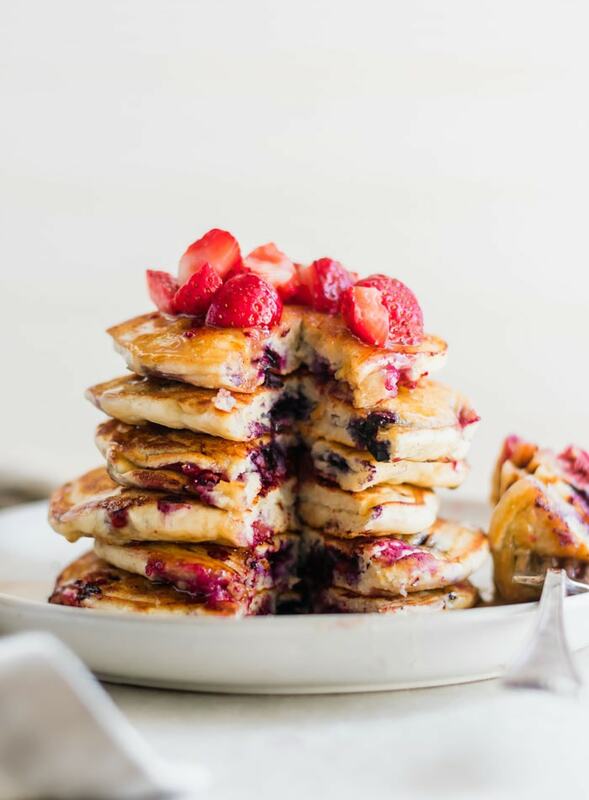 Once you’ve added the pancakes into the pan, spread a few berries on top of each pancake. For double banana goodness, add some sliced banana too. Cook the pancakes over medium heat until the middle starts to bubble and they look dry and firm around the edges. Flip and cook for another 1-2 minutes until they’re golden brown on both sides. Serve right away. Leftovers can be kept in the fridge or frozen and reheated as needed. For yummy pancake toppings try: peanut butter, date caramel sauce, sliced banana, fresh berries, coconut sugar, maple syrup or chia seed jam. 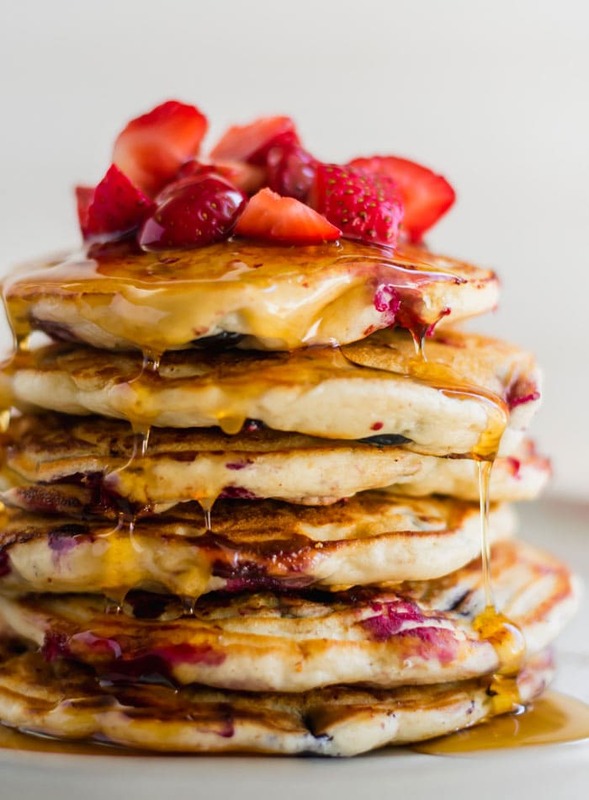 The pancakes looks so delicious and mouth watering. I loved the recipe. Thanks for sharing such an amazing recipe. Hi Deryn, tried making these today! Me and my man absolutely loved them. Had them without sweetener or berries. We found the banana beautifully sweet enough. Lovely weekend treat. We added a wee bit of cinnamon to the mix too. Thanks again for another top notch easy to make recipe. Awesome! So glad you and your guy loved them. I love this one too, so easy and yummy. Thanks a lot for the comment!